One of the most evident sensors of Android devices is the camera. An ordinary smartphone's camera is able to capture a lot of interesting information but has its limitations too. Most evidently, its viewing angle depends on the position of the device (so it is not fixed and hard to measure) and its bandwidth is (mostly) restricted to the visible light. It is therefore an exciting idea to connect special cameras to Android devices. 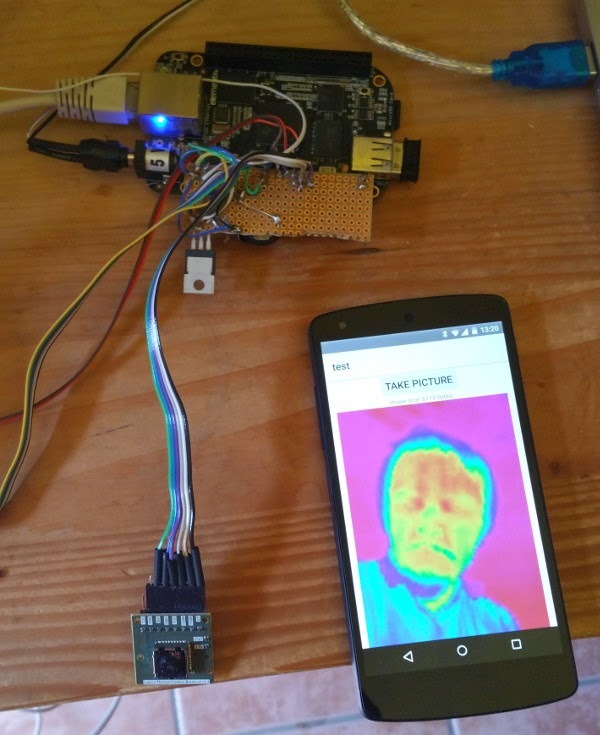 In this post, I will present an integration of FLIR Lepton Long-wavelength Infrared Camera to an Android application over Bluetooth Low Energy connection. Long-wavelength IR (LWIR) cameras are not new. Previously, however, they were priced in the thousands of dollars range (if not higher). Lepton is still pricey (currently about 300 USD) but its price is low enough so that mere mortals can play with it. FLIR sells a smartphone integration product (called FLIR One) but it is currently only available for iPhone and locks the camera to one device. Our prototype allows any device with BLE connection to access this very special camera. An Android phone with Bluetooth 4.0 capability. I used Nexus 5 for these experiments. An FLIR Lepton module. My recommendation is the FLIR Dev Kit from Sparkfun that has the camera module mounted on a breakout panel that is much easier to handle than the original FLIR socket. A BeagleBone Black card with an SD Card >4GB. A BLED112 BLE dongle from Silicon Labs (formerly Bluegiga). The software for the prototype can be downloaded in two packages. This package contains the stuff for the embedded computer. This package is the Android application that connects to it. Once you got all these, prepare the ingredients. Fortunately the BBB's SPI interface is completely compatible with the Lepton's so the "hardware" just needs a couple of wires. Do the following connections (P9 refers to the BBB's P9 extension port). I use Snappy Ubuntu. Grab the SD card and download the image as documented here. Before flashing the SD card, we have to update the device tree in the image so that the SPI port is correctly enabled. Unpack bt_ircamera.zip that you have just downloaded and go to the dt subdirectory. There you find a device tree file that I used for this project. Beside the SPI1 port, it also enables some serial ports. These are not necessary for this project but may come handy. The BLED112 stores the GATT tree in its firmware, hence in order to provide the GATT services that connect the BBB with the Android device, a new firmware needs to be generated and installed in the dongle. The config files are located in the config subdirectory in the bt_ircamera.zip archive. Follow the steps in this post to generate and install the new firmware. Once you are done, you can simply plug the dongle into the USB port of the BBB. and you are ready to go. On the Android side, select the BLE node with the name "test", connect, click the "Take picture" button, wait for the image to download and there you are. Note that the images are saved on the SD card, which means that they also appear in the stock "Photos" application. Now at last we can get to the technical issues with this prototype. One interesting aspect is that there is no standard BLE service that provides the functionalities - image capture triggering, image fetching - our system needs. That's not a problem, we defined our own BLE service. It is easiest to follow this service in irc_gattBLED112.xml (bt_ircamera.zip, config subdirectory). The interaction goes like the following. The BLE client connects and reads the irc_len characteristic. This characteristic is tagged as "user" on the BLE server side meaning that the BLE application must generate the value on the fly, when the attribute is read. In our case, reading this attribute fetches an image from the FLIR camera, converts it into PNG format and stores it in the apps' data folder, returning only the PNG file size. The Android application now can fetch the image piece by piece. First the Android application writes the irc_offs characteristic to inform the BLE server, what is the starting location of the fragment it wants to fetch. Then it reads the irc_pic characteristic which returns a maximum of 20 bytes of image data. This makes the image download very slow (takes about 10-20 second to download a general 5-6 Kbyte image to the Android application) but the restriction comes from a BLE protocol layer. Maybe the old RFCOMM from Bluetooth Classic would have been actually a better option for this application. Update: I updated the client/server application to make the download faster (it is still quite slow). In order to speed up, I removed the explicit setting of the file offset (so the irc_offs characteristic is not used anymore). This made the download faster but there's still room for improvement. Other than the issue with fragment size, both applications are pretty straighforward. Maybe the colors of the IR image are worth discussing a bit. The FLIR camera returns a matrix of 80x60 pixels, each pixel has a depth of 12 bit. Grayscale presentation is the most evident option but most displays have only 256 gray colors. In order to make the IR shades more visible, I used fake coloring. The algorithm is very simple: after the image is fetched, the maximum and the minimum IR intensity is calculated and the range between the two are mapped into a rainbow gradient of 400 colors.